Hi, I am interested in your 1961 Chevrolet Impala (stock #4529-CHA) listed on Autotrader for $82,995. I'd like to get more information about this vehicle and confirm its availability. Award-worthy paint, custom A/C interior, four-wheel disc brakes, and a performance LS V8 under the hood this 1961 Chevrolet Impala convertible is a stunning one-of-a-kind restomod thats so unique and powerful that it cannot escape the spotlight. You already know why the 1961 Impala is such a cool ride. There were some nice touches that did not make it onto any other year, and so they are sought after by collectors today. And because the convertible was one of the most expensive Chevys, it also is the rarest version today. But rarity is not what attracted you to this one. From the moment you lay eyes on it, you can tell its full custom that was restored to have better precision gaps than even the factory could have made. Next comes the kind of deep black paint that you can understand how slick it is simply by how it radiates light even under our indoor lamps. The closer you get, the more luster and shine you pick up there was some serious investment in getting it looking this amazing. This one has all the right bright work elements from the large wraparound bumpers, to the full-length sweeping trim that also gives a nice hint of the interior color. In the rear is one of the most intricate forms ever put to sheet metal. The dipping V is something so daring you could only get it in 61. The final step to making this a truly distinguished drop-top is the wheel package. Not only are the modern Billet Specialties wheels staggered 18/20 inches front/rear, but also you have an electronically controlled air ride suspension. So you can make sure to have the perfect lowered stance wherever you park. While the black folding roof fits sung, you know this was a car that was meant to be shared with the world. And with the touch of a button, it electronically stows away to reveal an aggressive and tasteful interior. This is a full custom red setup, but if you look closely, you can see some nice tributes to great Chevys. 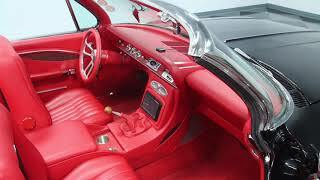 After all, the rear seats still carry the central logo that once housed the rear speaker; you still get the extra long speedometer; and the inserts in the seats and door panels pay tribute to legends like the 57 Bel Air. But everywhere else you look, this restomod offers plenty of modern upgrades. Those bucket seats have modern bolstering for all-day comfort, and in between them is a custom center console. This houses the controls for the air ride suspension and modern R134a air conditioning. It also houses the AM/FM/CD/DVD/XM touchscreen stereo with connections for Bluetooth and a full subwoofer stereo system. But even with all these goodies, its the grip of the sports steering wheel and the stick shift that remind you this is a true drivers machine. As much as youll love showing off the interior and exterior, its the motor that will really draw all the crowds. Under the hood is modern 6.0-liter fuel-injected V8. It looks absolutely devilish with the full black presentation thats only broken up by the occasional red or polished component (just like the exterior.) And this modern LS powerhouse earns its aggressive presentation, because from the moment you fire it up, the grow of the dual exhaust lets you know there has been further investment in performance components. You are in complete control of this modern brute and its thunderous soundtrack thanks to the strong Muncie four-speed manual transmission. But just because this has beastly power doesnt mean its hard to tame. Power steering, four-wheel disc brakes, and the modern grip of Nitto performance tires keep you in firm control. Youre probably already imaging the places you can go and how fast youll get there in this complete build. So hurry and give us a call before the best Impala around goes to someone else! Call now!